Microsoft has announced that it will be offering a browser version of mobile hit game Cut The Rope, with a set of special levels accessible only to people who use IE9 and pin the game to their Windows 7 taskbar. In what the company sees as a great way to highlight the pinning function between Win 7 and Internet Explorer 9, the hugely successful app hit Cut The Rope will be made available for all HTML 5 browsers. However, to access the specially created extra levels, users will have to pin the game. Gabby Hegarty – the UK's IE lead for Microsoft – explained that Zepto Lab and Pixo Lab had worked on the HTML 5 version to showcase the modern browser. "For us this is a great example of how HTML 5, IE9 and Windows 7 can all work together to create a rich immersive web experience," Hegarty told TechRadar. "We've been working closely with developers to push HTML 5 to the limits and this is one of those partnerships." The move obviously echoes the arrival of Angry Birds for Google Chrome last year, but Hegarty insists that Microsoft is all about openness, although the decision to make seven levels only available to a limited audience is designed to prompt people to switch to IE. "Once the user gets through the 18 levels will be prompted when they get there either to download IE9 or, if they already have the browser, to pin it to their taskbar." An obvious drawback about Microsoft pushing taskbar pinning is that it soon becomes clogged up, something which Hegarty is aware of. "From our point of view we expect people to pin around five or six things to their taskbar; things they use most of the time like email or search," she added, confirming that unpinning the game would lose access to the levels. "If we can encourage people to pin Facebook or National Rail that they would use every day and see the benefits then we'll be happy. 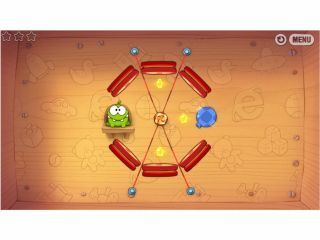 "We definitely didn't want to lock [Cut The Rope] all down; [the special levels] are purely thrown in there as an awareness about pinning, the rest of it's completely open. "We did have debate about locking things down for pinning because we're all about open, but this is clearly about awareness of pinning."